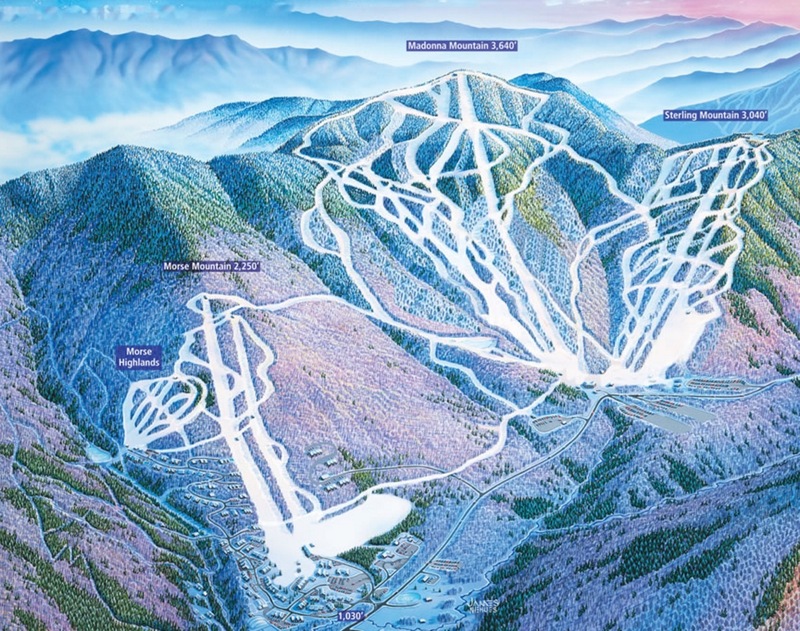 Popularly know as Smuggs to locals and vacationers alike, Smugglers’ Notch is a northern Vermont ski area situated on Rte. 108 in Jeffersonville. Named for the Lamoille County mountain pass, reportedly used by smugglers during prohibition, that connects Jeffersonville to Stowe, Smuggs is a 3 mountain resort justifiably famous for its family programs. The children’s programs are, indeed, special and bring families back the mountain year after year. The not-so-well known thing about Smuggs is its terrific terrain. It lists 78 trails but there are lots of ways down the mountain including plenty of ways to mix it up as well as some unlisted trails and glades. If you’re not an expert, it’s best to ask before you head down even some of Smuggs blue squares. They can be challenging. You’ll have to put up with some old-fashioned, fixed 2-seater lifts but on most days the 13 minute ride provides a chance for some interesting conversation that you’re unlikely to find anywhere else. I’ve hooked up with new visitors and made their day by showing them some creative runs down the mountain. You just don’t get that on a 4 minute detachable ride. On sunny days, the view from the top of Madonna is stunning as the crowds taking photographs will attest. (Have a local point out Mount Washington and several other ski resorts) All 3 mountains have terrific views. This is a terrific place ski. If you’re staying at the resort it, offers all the amenities. Locals also frequent The Brewster River Pub & Grill & Stella Notte close to the resort on 108.